No matter if you are a fan of incredible running games or just want a fresh perspective on the genre, Jetpack Water Jump will engage you into the ultimate run and dash experience through amazing journeys. In the beginning falling into the water can make it hard to come back, but as you get more experienced, you will need to get in to rack up higher scores and combos. Masterize your jumps to gather coins to unlock bonuses and new characters. Each new challenge will bring in a massive rush, but complete it and you will be well rewarded. This is a great game for people who wants a relaxing and fun way to test and improve their reaction time and skills. With great graphics, multiplayer as well as amazing gameplay mechanics, Jetpack Water Jump is the ultimate way to spend your time within the family. 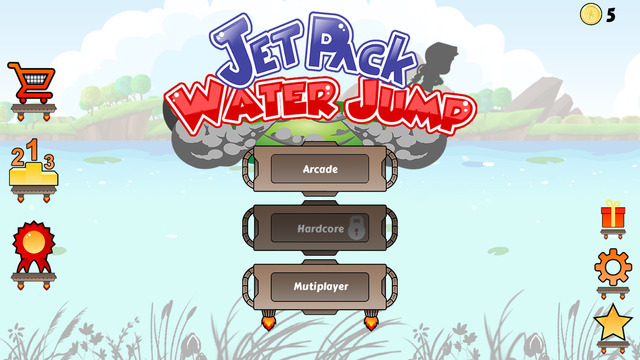 Just try out Jetpack Water Jump right now and you will love it !